Katie is an 18-month-old who does not respond when her mother calls her name, likes to watch spinning objects, and does not use words or gestures to communicate. Jose is a 17-year-old student who gets stellar grades in all his courses, started the cyber security club in his high school, but he does not have anyone he can call his friend. This toddler and teenager reflect the continuum of abilities and disabilities that is autism spectrum disorder (ASD). As a society, we in the United States are doing a truly remarkable thing. We have made a commitment to provide an appropriate educational program in the least restrictive environment for children and youth with ASD and other disabilities, and to make sure that the practices in these programs are based on evidence of effectiveness. But, where do teachers, other practitioners, and parents look to find out which practices are based on research evidence? We would not expect them to go to the research journals to search out the practices that work. 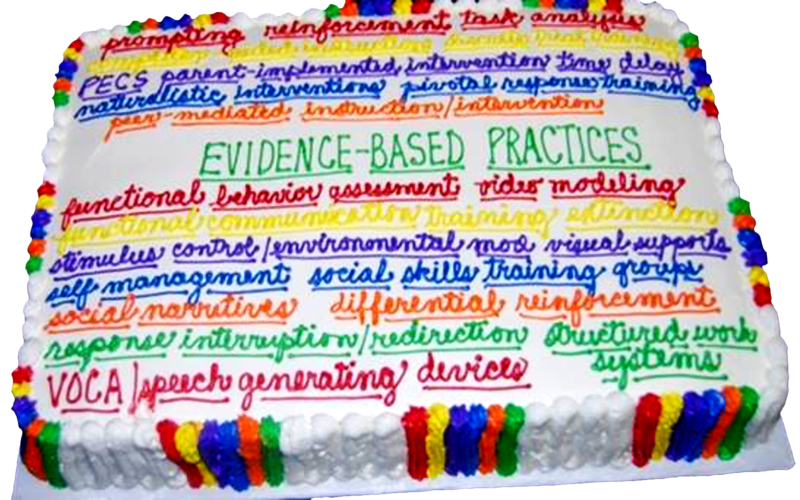 In 2007, the Office of Special Education Programs (OSEP) funded the National Professional Development Center on ASD (NPDC) to promote practitioners’ use of evidence-based practices. One of the first activities of the center was to conduct a comprehensive review of the focused intervention research literature. NPDC conducted an updated review in 2014. The review screened 29,000 articles on autism and identified 27 practices as evidence-based. To identify interventions or teaching strategies by name and definition is not enough information to prepare teachers and others to use them in their work with children and youth with ASD. They need to be translated into specific, practical descriptions, with examples of how to use the practices to support learning and development. With funding from OSEP, NPDC investigators created online modules for all of the 27 practices. The modules contain clear directions about how to implement practices and include video examples, fidelity checklists, and downloadable PDFs for all the module content. The website is free and has over 45,000 registered users to date. It has become a major source of information about evidence-based practice for children and youth with ASD in this country and around the world. For example, over 400 teachers are part of the CAPTAIN Project in California and they are committed to incorporating these practices into their programs for children with ASD. The SOTIS program in Warsaw, Poland is using these practices in multiple autism preschool centers. Individuals from China, Italy, Saudi Arabia, Morocco, and Poland have voiced interest in translating the practices into their native language. Knowledge about effective interventions does not stand still. In the years since the last review ended in 2011, we have located over 26,000 articles published on autism intervention and have launched an update of our previous review through the new National Clearinghouse on Autism Research and Practice at the Frank Porter Graham Child Development Institute, University of North Carolina at Chapel Hill. Over 150 reviewers are currently evaluating the quality of research articles to be included in this updated review. There is always new work to be done in this area and, pending funding, we hope to extend the review to interventions that have been conducted with adults with ASD and to conduct an annual update to the evidence base, including updating the online modules with new information from the research literature.